We've got a lot to cover today. Let's start with these beautiful cookies. First, they're pretty. Second, they're chocolate. And third, they're laced with booze. Not many ways to top that. The cookie is soft and chocolatey, but the Bailey's Irish Cream leaves an undertone of something different that pairs nicely with the white chocolate chips. A perfectly chewy cookie with several layers of flavor, just asking to be paired with a glass of milk. Yum. I'd pinned this recipe around St. Patrick's Day when the Bailey's recipes started making the rounds. Ali from Gimme Some Oven posted this lovely treat and I didn't care to wait a full year to make them. I'm not even sure why I made them in the first place, but the recipe was so easy and the cookies taste so perfect, that I had to make them again. 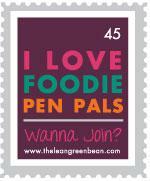 This time for sharing with my Foodie Pen Pal. It's really not much for looks but oh, does this ever taste good. The juicy chicken blending with creamy, melty Swiss cheese and sweet ham, covered in a seasoned bread coating, this meal is perfect comfort food. Served over a bed of egg noodles, it's just perfect. Plus easy since it's a crock pot meal. When Dave's parents, Madaline and Ernie, came home earlier this month, Dave and I were both off to work when they arrived. I wanted to have something at the ready for dinner, so I put this together in the morning, plugged it in and by the time we were all got home, the kitchen smelled great and dinner was a pot of boiling water away from being on the table. No plated meal pictures this time around--it was just a mess, but a delicious and very satisfying mess is was! Dave is a huge fan of chicken cordon bleu, but it's a lot of work. I don't really make breaded chicken and then to stuff it and then bread it--ug, that sounds like work. I don't want to work when I cook. So when I saw this recipe on Pinterest, I pinned it before I even read the recipe! And then I made it immediately (ok, well, like 3 days later, but still). Nikki at Chef in Training posted this and it's just too easy and too delicious not to try. I used a little less stuffing mix because my store had 6 ounce boxes (not 8 ounce--weird), and I probably used a little more ham and cheese because I wanted to completely cover the chicken breasts. I probably should have used a bigger crock pot so I could have just one layer, but I didn't realize my chicken breasts weren't going to fit until I'd already gotten started. Next time, I'll go with the 6-quart crock pot. Because everyone loved this, so there will absolutely be a next time! I had a lot of limes leftover from Cinco de Mayo. Apparently we didn't make as many margaritas as I expected. So what do you do when life hands you limes (but fails to deliver on the tequila)? You make lime bread! This is a tart bread, but soft and cakey, and lots of lime flavor. Lime is well complimented by cranberry, white chocolate, and coconut, among other things, so if you want to cut some of the tart lime flavor, consider adding a cup of mix-ins, which will also be a nice variation on the texture, as well as the taste. Some of this lime bread went to work for a meeting, some stayed home for Dave, Madaline and Ernie to enjoy, and the rest is in the freezer (probably until the next time I see Cindy--she'll probably love this stuff). For this recipe, I made some adjustments to the Lemon Bread recipe I used a few months ago from Lind at Stick to Your Hips. While that recipe is great, I wanted to experiment with substituting sour cream and applesauce for some of the butter and thought this would be a good opportunity since I could compare. The results were pretty awesome--a slightly softer bread, but otherwise I didn't notice the missing fat. Again, I went with two big loaves (8 x 4 and 9 x 5), but mini loaves would be great since this packs a lot of lime in it (a result of wanting to use all my extra limes). One thing I might change is that the lime glaze--more like a syrup--didn't complement this bread the way the lemon glaze added to the lemon bread. Instead, I'd suggest adding a bit more powdered sugar and making a thin glaze that will set, rather than the syrup version of a glaze. The recipe below is for the syrup-style, but let me know if you do it differently! Is there anything cuter than mini muffins? Ok, puppies and babies are cute. Let me clarify: is there any cuter baked good than a mini muffin? Oh, wait, little mini cupcakes with gobs of frosting as tall as the cupcake are pretty cute. Hmm, well what I'm trying to say is that these mini muffins are cute! Plus you get to eat loads of them because they're tiny. And you'll want to eat loads of these. Soft on the inside, lots of peanut butter flavor and speckled with mini (so cute!) chocolate chips, I'm pretty sure eating by the handful is acceptable. If not, I've been unacceptable recently. These were a just because kind of treat and since it made so many, I sent some with Dave to a vendor show for him and his colleagues. Dave loves peanut butter and chocolate and I liked how this recipe from The Baker Chick was heavy on the peanut butter with a chocolate kicker. Often it's the other way around. But anywho, Audra from The Baker Chick is a lovely blogger, recently engaged, who makes beautiful desserts and fun treats, among other things. 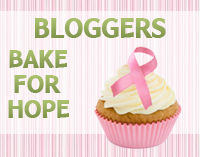 I can't remember if I've shared one of her recipes before, but you should definitely poke around her site. These were easy to make (just two bowls, a whisk and a spatula) and since they're so stinkin' cute and ultra-tasty, they'll put a smile on your face while you bake and eat one. Or three. Or ten. Remember when I made Buffalo Chicken and Blue Cheese Meatloaf and was so excited because meatloaf could have a personality? Yeah, I guess meatloaf has some sort of food schizophrenia because this meatloaf is also awesome and had a totally different personality! When did this happen? And is meatloaf ok with it? I hope it's not having an identity crisis, because frankly I'm excited by the many faces of meatloaf, namely the face that makes them all tasty. This was a great version of chicken parm--lots of flavor and cheesy, saucy goodness. And it's not fried, so it's definitely better for you than the traditional route, especially if you opt for a reduced fat or fat free cheese. I'd pinned this recipe a while back and since I'd realized that my meal plan for the week included some variation of Mexican nearly every night, I decided it was a good time to branch out. Dave loved the idea since he's a big fan of the original version and he enjoyed this as well. The recipe comes from Joelen at What's Cookin' Chicago, which has lots of yummy dishes you should probably check out. The only adjustment I would make is maybe to mix some mozzarella cheese in with the ground chicken since we like things cheesy where I live. But otherwise, this was perfect and delicious and yummy paired with a side of pasta and a salad. I happen to think that dessert for breakfast is a good idea. After all, I bake. A lot. That's why things like muffins and coffee cakes (hello they say cake right in the name) and sweet quick breads are so appealing. But if I can make a regular breakfast of waffles be dessert too, well then that's just perfect. Because when I ask Dave if I can have ice cream at 9 am and he says no, it kind of makes me a sad panda. But if I ask him if he'd like me to make waffles, he really can't argue with me when they turn out to have chocolate in them. Because he didn't specify that they couldn't be dessert waffles. It's a win-win really--he gets waffles and I get dessert. Everyone's happy. And you'll be really happy when you make these. They are simple, delicious and aren't overwhelmingly chocolate flavored, so it just the right level of dessert flavor in a breakfast. Not too sweet, but definitely not a regular plain waffle. Served with berries and powdered sugar or topped with more chocolate syrup, these are a nice treat and change of pace from the typical breakfast. Or just call a spade a spade and top them with whipped cream and sprinkles and truly have dessert for breakfast. This recipe came out of Food Network Magazine's March 2012 issue which was all about chocolate. Created by Derek Flynn from the Food Network Kitchens, I loved that this was as simple as any other waffle recipe I've made. I thought it was unique to use chocolate syrup rather than cocoa or melted chocolate. The resulting chocolate flavor was still pronounced, but not overly sweet or bitter. Waffles may be a one at a time production, but I think they are an easy way to crank out freezer breakfasts (this recipe will make about 8-10 waffles, depending on the size of your waffle iron) or keep them coming as your family wakes up in the morning. Alternatively, you can keep waffles warm but heating your oven to 250 degrees F and as they finish cooking, place them on a cookie sheet in the oven until your ready to put them on the table. Whatever your plans are, enjoy these chocolate waffles for a fun twist on breakfast. I'm pretty sure sprinkles make everything a celebration. Doesn't that just seem like the natural order of things? Of course I made these for birthday baking and sent some to both of my dear friends named Lisa for their respective birthdays. And Dave and I enjoyed the leftovers as celebration cookies for no particular reason. It's sunny--let's celebrate with a Funfetti Cake Batter Cookie! It's raining, that's ok, let's celebrate with a Funfetti Cake Batter Cookie! See, it just kind of works that way. These cookies are sweet, pretty and taste like cake, which makes them the perfect birthday baking treat. They turned into a perfectly crackled cookie with a crispy outside and slightly chewy interior, resulting in a close to perfect cookie experience. Besides being delicious, these cookies are a breeze to whip up, thanks to a prepackaged mix. Stephanie at Cookin' Cowgirl hit the nail on the head when she started with a plain cake mix and opted to add in the sprinkles herself. I was skeptical about the quantity (1 cup of sprinkles is A LOT! ), but she was right--if you want a pretty celebration cookie, you really need all those sprinkles. They completely take over, providing the extra sweetness but without making a toothache-inducing cookie. Stephanie mentions using a vanilla cake mix, but I couldn't find that so I used plain white and found it perfect. I love the color of the cookie and how it acts as a perfect canvas for the sprinkle to pop in all their glory. I also opted to flatten my scoops of cookie dough a bit because I wanted to make sure they spread out and baked evenly, rather than end up as cookie nuggets. Make these cookies for your next birthday or celebration, or just make these cookies and you'll be celebrating! I love appetizers and I love dips. As I told you last month, I've been know to just have pita bread and hummus as a meal. And this hummus is a perfect match for pita bread, whether the whole soft piece or with some crunchy chips. I usually stick with the traditional flavored hummus, but I do like roasted vegetable variety and Dave and I recent discovered a buffalo-style flavor which is delicious. This version of spinach and roasted garlic provides a lot of flavor in a creamy dip. And all that protein and fiber makes for one filling dish--I really can have this as a meal! It's Secret Recipe Club reveal day again and this month I had the pleasure to be assigned to Fit Mama Real Food who has A LOT going on right now. Not only did Heather change her blog name (from Healthy with Heather) and redesign her whole website last month, but this month (or the beginning of June) she and her husband will welcome a baby boy into their family. Heather is a healthy eater and fitness enthusiast who blogs about her food, fitness, home improvements and her pregnancy journey. I really like Heather's spin on healthy eating because she's not afraid to give chocolate a home on her blog (I really considered making these) and most of her recipes have accessible ingredients. Heather's sensible approach to food is definitely a bandwagon I can get on. I didn't change a thing about Heather's recipe, it's hard to mess up hummus. As long as you use the right ingredients and a food processor to make it all smooth and creamy, you'll love this dip. I'd been asked a few months ago about a "breakfast" cookie and thought these would come close to fitting the bill since they are a relatively healthy cookie. Well, they aren't quite ready to take a place at the breakfast table, but they are on the healthy side of sweet treats, so I whipped up a batch to share as birthday baking for my Grandma and friend Lisa who is pregnant and likes things a little less bad for you. I'd pinned this recipe and thought the flavors were pretty interesting. Jaclyn at Cooking Classy did a great job with this one. I opted for all cranberries instead of part raisin and really like the outcome. I got far more cookies than Jaclyn did, but I wasn't sure what size to make them, so I deferred to a small cookie scoop. I also left off the glaze because I really didn't think they needed it. Don't be afraid of carrots in your cookies--these are wonderful and unique. Make, share, love. This is one twist on banana bread that you'll definitely want to try. It's pretty amazing how the banana flavor works so well with the chocolate, coconut and almond components of the Almond Joy candy bar. Nothing is too overwhelming and all the flavors invited to the party play nice together. This is a dense bread but still has a soft crumb from the bananas and yogurt. I really like the chocolate and almond flavors paired against the banana, and the coconut is subtle but still recognizable, which is nice. Dave really likes this idea but since he's more of a Mounds kind of guy, the sliced almonds were a good choice to add a bit of crunch and flavor without creating big chunks of nuts. I was started to get a bunch of overripe bananas again (anyone remember these from bananapalooza last year? And this and this? And these?) so I wanted to get a jump on being overcome with bananas. I'd pinned this recipe a while back and thought this was the perfect time to try it. Lauren From the Little Yellow Kitchen really hit this one home, blending all the flavors into a perfect loaf. The ingredients are easy and the only thing I needed to get were the almonds. I opted for sliced over slivered because I didn't want them to be chunky in the batter, just a crisp taste. And I used milk chocolate chips rather than chopping because I happened to have that on hand. By the way, I promise you I didn't actually burn my loaf! My oven was in use for actual food (hey, Dave and I like our dinner), so I popped this loaf in my toaster oven (which does a might fine job of baking, if you remember). When the loaf was rising in the oven, it came very near the top of the inside of the toaster oven, so the top got extra browned, but it didn't crisp up or actually burn; it's just not the prettiest loaf. But what does that matter. We all know it's what's inside that counts. And inside is nothing but yum! Veggies, cheese and little ham all wrapped up in a crusty breading? Yes, please! Dave loves these things so when he actually contributed something to the weekly meal plan by suggesting them, I was more than happy to oblige. These are delicious and actually not complicated to make. I even made them while camping a few years ago. Cheesy and stuffed to the gills, these pockets are kind of like a stromboli or calzone, and mighty delicious. I serve them with marinara sauce for dipping (try the sauce from the Pepperoni Pizza Ring) and they are perfectly filling for dinner or lunch. This a recipe from some random recipe card I got in the mail for some reason or another from a company trying to get me to buy a bunch of cooking stuff because they wooed me with free recipes. Needless to say, I didn't buy the stuff, so I'm not actually sure what company sent this. I did adapt the recipe by using whole wheat pizza dough instead of frozen bread dough and adding lean ham for bulk and extra flavor. Made with low-fat cheese, these aren't that bad for you, and are loaded with veggies. You could swap out some of the broccoli for mushrooms or squash for a new twist or use chicken or some other lean meat, but we like these just as they are. I wanted to make a coffee cake and thought I was doing a pretty good job. The batter came together quickly, the ingredients were easy, and I didn't even need to use the stand mixer, just two bowls, a whisk and a spatula. It came out of the oven with a perfect spring on it's golden top and the cake tester promised me it was done. I even frosted it and the results were so pretty. Luckily I decided that before I took it to work for a meeting the next day, I'd slice it at home. I'm so glad I did. Because my cake tester lied and my oven got reamed out. The entire center of the cake, which didn't even sink upon coming out of the oven, was undercooked. Ug. Clearly this would not do. So I ran to the internet to find another recipe that I could make quickly since it was getting close to bedtime and I could not go to that meeting without treats the next day. Luckily, I found the recipe for these lightly sweet, tropical treats using a fairly uncommon baking ingredient--pineapple. The pineapple, coconut and orange lent themselves to a nice tropical combination that really went nicely with a mini muffin. Searching through Google, I eventually came across this recipe from Baking Bites. Nicole did a great job with these but I did make an adjustment to used drained canned pineapple instead of fresh. I also adapted the recipe to make mini muffins given the state of the oven that evening, I thought I'd have more control over the "doneness." Ultimately this was a good alternative to the coffee cake, but that won't stop me from making one soon.